Galootapalooza 7 Hits the North Side of Chicago! Time flies when you're having fun, and it's time once again to put another Galootapalooza behind us. This year saw 15 Galoots plus "Future Galoots" Nathan Hurrli, Jim Vojcek and Keith Pyle make the trip to Chicago for the 7th annual Galootapalooza gathering. Scott Parker and Gil Chesbro, I'd still be rearranging the basement! In addition, many Galoots brought dishes for dinner and dessert, so to say that we had a rather large and satisfying meal would be a great understatement! 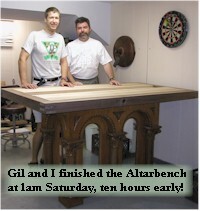 Preparations for the gathering continued into the wee hours of August 3rd, as Gil Chesbro helped me to finish a down and dirty walnut and birch bench top to help accommodate our two classes for the day. 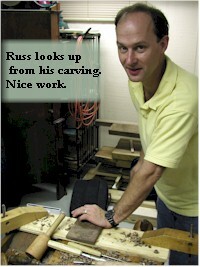 Scott Parker came over to help me start the dimensioning on the stock. But lots of help and some Galoot Magic got it done! The other side of the shop looked like this before Scott came over last Sunday. After Scott and Gil, we had 17 guys standing and working comfortably in the same space! The first event of G7 was Getting there. 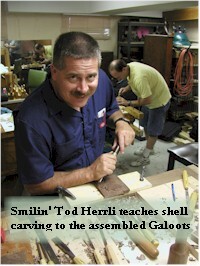 Then, Saturday afternoon, Tod Herrli taught a shell carving class to three fast learning carvers, and Mike Lindgren. I kid, I kid! Actually Mike's one of those guys whose work is perfect. He's just fun to tease. Since everybody now had sharp tools, we stayed clear of the frosty products of Goose Island Brewing Co. in Chicago. 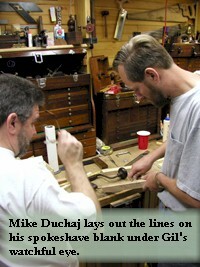 While Tod taught the carving class, Gil Chesbro taught Mike Duchaj to make his own spokeshave. Gil has done this many times, so while he helped Mike, he made a nice apple wood shave for Tod Herrli.Mike's blank was some figured birch that I picked up with the wood I used for the bench top. 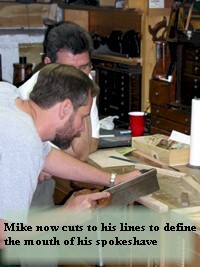 I think that Mike enjoyed working with it, and Gil brought some home to make a shave with as well. 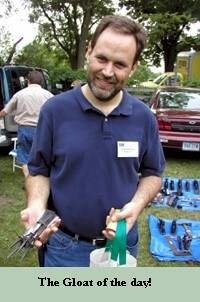 Ron Hock, who expressed a bunch of blades to me on short notice. 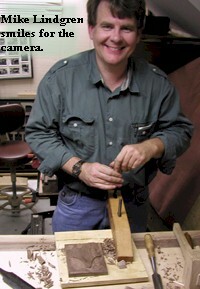 Great, sharp-out-of-the-box blades that made even my first attempt at spokeshave making a success. Thanks Ron! 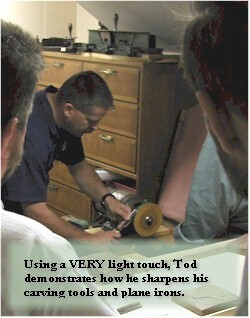 While we were playing around in the basement, preparations began for supper upstairs. 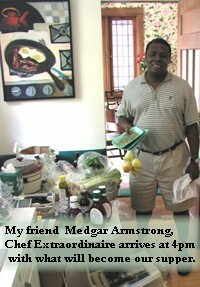 My good friend, the late, great Medgar Armstrong agreed to do me a HUGE favor by preparing our supper and grilling it up. I had missed the last two Galootapaloozas and this allowed me to spend time enjoying everybody's company. I'll always owe Medgar bigtime! Supper consisted of Mike Lindgren's Potato Salads (One with olives and eggs, and the other with garlic) Ralph's famous veggie chili with habaneros, Mike Duchaj's outstanding baked beans. Jerry Serviss' excellent potstickers and sauce.Ontop of that Medgar prepared grilled eggplant corn on the cobb, butterfly pork chops in cilantro sauce, italian and bar-b-qued chicken breasts and mushroom stuffed burgers. Dessert was provided by Fausto Momoli's choclate brownies and Doug McLerran's apple squares and choclate caramel brownies. for us. MAN, we ate WELL! We actually ran out of seating, so not shown is: Scott Parker, Medgar Armstrong, Lisa Groot, and Myself. For a large photo, click the image. 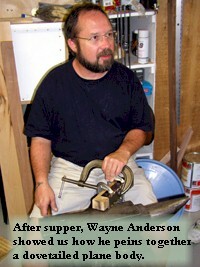 After supper, we went back to the shop for Wayne's "peining a dovetailed a plane body" demonstration. 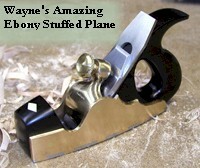 In just about twenty minutes, Wayne gave us all a much better idea of how those dovetailed bodys he makes go together. For more detailed photos follow this link. We weren't full enough, so let's bust into the cake. Modeled after a Norris #13 Infill plane, our cake was chocolate with raspberry filling and butter cream frosting. Oh man! 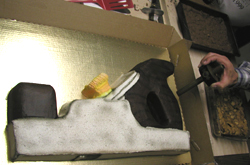 That's Mark's hand holding a mortise gage to give you an idea of how large this cake was. That was it for the Galootapalooza 7 event. Everybody headed home to get some sleep for early pillaging at Garfield Farm the next day. Gil and I moseyed out of the house around 6:10 am. Electing to sleep in, since we weren't really looking to buy anything. When we arrived at Garfield, the Galoots had found some great buys. 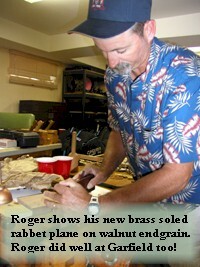 Roger picked up a set of Addis chisels and Ralph had scored the gloat of the day. We tried to find flaws with his Erik Anton Berg chisels for a ridiculously low price. Yet another Galootapalooza has come and gone. We had a great time meeting our virtual friends and seeing the usual suspects once again. I think it's safe to say that everyone is looking forward to the next Galootapalooza. 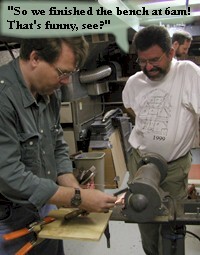 Maybe next year we can have the "Guess the 'P' in P. Wheatly" contest? All Images and words ©WJG 2000-2011. All use in any media prohibited without the express written consent of the owner.